This pastry-flavored layer cake is a mash-up that makes sense. Our friend Sharen Leonard and her husband invited my sweetheart and me to dinner in Boston earlier this year. It was her birthday, and she told us she’d be baking herself a cannoli cake to celebrate. I understood the impulse. I like to bake my own birthday cake, too. But the cake I did not understand. Cannoli cake? I pictured a stacked tower of cannoli, perhaps from the city’s beloved Mike’s Pastry, and possibly secured by chocolate sauce – a kind of Italian version of croquembouche. 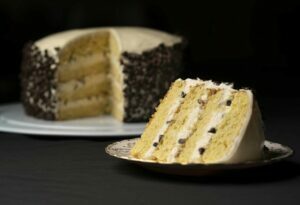 So I was surprised when after the (delicious) meal, Sharen brought out an ordinary – though quite pretty – layer cake: white, delicate-looking and dotted with mini chocolate chips. It turned out to be a simple butter cake iced with some of the flavors and ingredients of cannoli: ricotta cheese, citrus, cinnamon and chocolate chips. Sharen later sent me the link and annotated it with her own careful baking notes. I’d be willing to bet that the cake is an American invention (though a cousin of Cassata Cake), the sort of mash-up of cultures and dishes that’s so popular in American kitchens today (think cronut or sushi burrito or pastrami bao), probably because they reflect the nation’s mash-up of cultures. That may be causing an ugly political debate, but in the case of Cannoli Cake, the mash-ups win, hands down. I tasted it in the depths of winter, but I think this dainty cake would ideally round out any Easter meal. This recipe is adapted very slightly from Lisa Huff’s at snappygourmet.com. Had I had any candied orange zest, I’d have garnished the cake with it and perhaps added a little to the filling – next time. There will definitely be a next time. Preheat the oven to 375 degrees. Butter 2 (8-inch) round cake pans. Line the pans with parchment, then butter and flour. Whisk together the flour, wheat germ, baking powder and salt. Set aside. Combine sugar with zest, using your fingers until the sugar is fragrant and the zest well-distributed. Beat together the butter and flavored sugar in the bowl of an electric mixer on medium speed for a few minutes until light and fluffy. Beat in the eggs, one at a time. Beat in the vanilla and almond extracts until combined. Add the combined dry ingredients to the batter in three additions, alternately with the milk, beginning and ending with the dry ingredients, beating until just combined to avoid toughening the cake. Divvy the batter up evenly between the prepared pans. Bake for 30-35 minutes until a tester emerges clean and the cake springs back slightly when you touch it. Cool cakes for 10 minutes, then flip out of pans and finish cooling on a cooling rack. When cakes are completely cool, slice in half horizontally with a long serrated knife to form four layers. To make the frosting, beat together the ricotta and mascarpone in the bowl of an electric mixer on high speed until well combined. Beat in the vanilla, orange juice, cinnamon and salt, then gradually beat in the confectioners’ sugar until the frosting is a fluffy, satiny and spreadable consistency. To assemble the cake, place one layer on a cake plate, cut side up. Top with frosting, then sprinkle with 2-3 tablespoons of the chocolate chips. Repeat with the remaining layers, placing the fourth and final layer cut-side down. Frost the top and sides of the cake, and press more chocolate chips into the sides, if you like. Pipe any leftover frosting decoratively on the top of the cake. Store in the refrigerator. Remove at least 30 minutes before serving.